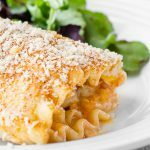 Before I created these chicken cordon bleu lasagna rolls, I had only eaten the traditional version; which is flattened or butterflied chicken breast rolled with inner layers of meat and cheese. The traditional dish is either fried or baked with a sauce. The recipe list looks long, but most of the ingredients are spices and used several times to layer the flavors. It’s rolled lasagna noodles with Swiss cheese, ham, and ground chicken inside, topped with a spicy Cajun sauce and seasoned bread crumbs. Sounds simple, because it is. I like to get the noodles out of the way since I hate waiting for water to boil, so I start that process at the same time as browning the ground chicken. I like to salt my water for noodles and add a bit of olive oil as well. Browning ground chicken is straightforward: add seasoning, break it up, cook it. Set it aside. Once the noodles are done, allow them to cool and spray them with oil if they’re sticky. Clear all the clutter off your counter, you need space. Make an assembly line of lasagna noodles topped with cheese, ham, and ground chicken (the wee chicken pieces might want to roll out…simply put them in their place… Know your roll ground chicken). Roll them up and place them in a large pan. I used my 13×9 glass dish. Making the sauce is just like making gravy or roux if you’ve done that before. Melt butter, add a bit of flour, whisk in chicken broth & seasoning. Make sure to whisk, whisk, whisk. There are a few crucial seconds there when making gravy that you can’t slack off. Once you have it incorporated, you’re good. Season it, boil it (for about 2 minutes), and take it off the heat. Drizzle the chicken cordon bleu lasagna sauce on the rolls in the pan and start on your breading. The breading is the easiest part, combine the ingredients and sprinkle it on top. Done. Bake it uncovered in a preheated oven of 350 degrees for about 10-15 minutes and enjoy. If you made this beforehand and refrigerated it, tack on a couple extra minutes in the oven (30 total). Swiss cheese, ham, and ground chicken rolled in a lasagna noodle, topped with a spicy Cajun sauce and seasoned bread crumbs. Preheat oven to 350 degrees and start a large pot of water to boil for the noodles. In a large skillet, combine the ground chicken, 1/2 tsp garlic powder, 1/2 tsp paprika, and 1/2 tsp salt. Cook on medium to medium-high heat until done (10-15 minutes). Remove from heat. While waiting for the ground chicken to brown and the water in the pot is boiling, boil the lasagna noodles for 6-8 minutes or according to directions on the box. Drain and spray with non-stick spray or olive oil so they won’t stick together or to the counters. While the noodles are cooling, start the sauce. Melt 4 tbsp of butter in a skillet on medium-low heat. Once the butter is melted, sprinkle the flour evenly over while whisking it quickly. After 30 seconds, slowly whisk in the chicken broth. Continue with the whisk until the cooked flour is incorporated into the broth (without lumps). Bring to a simmer. Add to the sauce 1/8 tsp cayenne powder, 1/2 tsp smoked paprika, 1/2 tsp salt, 1/4 tsp garlic powder, and lemon juice. Allow the sauce to boil until slightly thickened (about 2 minutes). Once the sauce is thickened, remove from heat and add the pieces of Swiss cheese, stirring slowly as they melt. On a large flat surface, place a lasagna noodle on the bottom, with layers of ham, cheese, and ground chicken on top. Slowly roll the lasagna noodle and place in a large 13×9 dish with the seam-side down. Continue until all noodles are rolled. Drizzle the sauce on top of the rolls in the dish. Combine the breading ingredient: 1 cup panko, 1/2 tsp salt, 1/2 tsp smoked paprika, 1/2 tsp garlic powder, 1/2 tsp black pepper, 1/2 tsp cayenne pepper. Sprinkle on top of the lasagna rolls and sauce. Bake uncovered in a preheated oven for 10-15 minutes or until the cheese is thoroughly melted inside. If preparing these ahead of time (unbaked), bake in the oven for 30 minutes if chilled.